The legendary character actor, Walter Brennan led a dual career in the late 50’s and early 60’s making long playing records often in the character of the western sidekicks he played. In 1962 he enjoyed a world wide hit with “Old Rivers” the sentimental story of a mule. On this 2CD set we present two of his earlier recordings released on Everest Records in 1960 and appearing on CD for the very first time. “A World Of Miracles” features Walter narrating nine tales from the Bible accompanied by an Orchestra and Chorus. 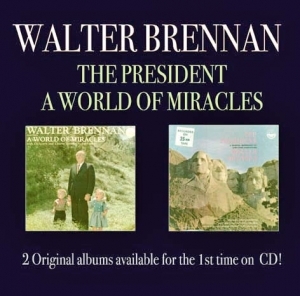 On “The President” we find Walter narrating the many milestones in the careers of some of America’s most notable heads of state from George Washington to Dwight Eisenhower again accompanied by an Orchestra and Chorus.